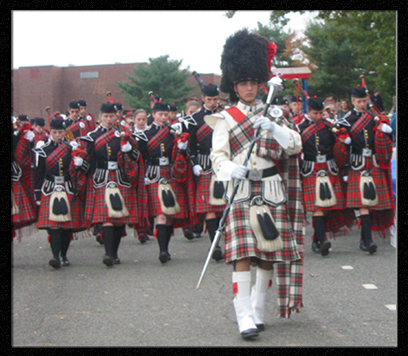 The Highlander Marching Band wears the authentic Royal Stewart Tartan Kilt, Plaid, Glen Garry and Sporran. The uniform is that of the Black Watch Regiment. The kilt contributes to the unique appearance of our Highlanders. Its original form was that of a blanket wrapped around the body for warmth. Gradually it evolved into two pieces; the plaid (which is worn over the shoulder) and the kilt. A kilt consists of seven to eight yards of tartan with three inch pleats in the back. 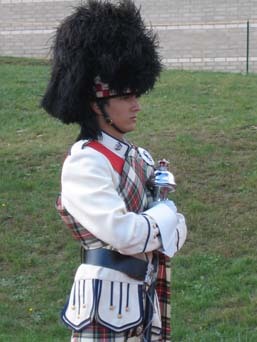 Our Drum Major wears the formal dress Royal Stewart Whites and carries the crested mace, a symbol of leadership. The busby is another trademark of our Highlanders and is almost identical to that worn by the guards at Buckingham Palace and Windsor Castle. The Governor Livingston Highlander Band enjoys a long tradition of musical excellence. Continuing the centuries old lead of the Scots Guard, our Highlander's music and motion retain a respectful degree of old world traditions, while blending in contemporary sounds and sights. The spirit and dress of the Scottish Highlands are present when the Governor Livingston Highlander Band makes an appearance. The Governor Livingston High School was named after William Livingston, the first Governor of New Jersey. William's father, Robert Livingston was originally from Ancrum Scotland. 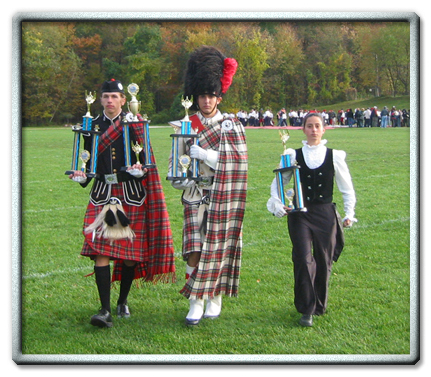 It is this connection that led the school to adopt the Scottish Highland motif and the Royal Stewart tartan and colors. On their latest trip to Scotland this year in 2004, the Band wanted to explore these roots and they stopped in Ancrum where they were met by several local officials, many residents, news reporters and a radio reporter. Ancrum is a small town with a population of under 300 people. However, many of them, including most of the children turned out to greet the Band. The bagpipe is one of the instruments contributing to our Highlander Band's distinctive sound and has become a band trademark. It is of ancient origin; sculptures of it appear in Egyptian carvings that date from 1500 B.C. No doubt its ancestor was the simple cane pipe to which a bag was added to enable the player to produce continuous music. The Highland bagpipe was originally a solo instrument, and every clan chief had his own hereditary piper. The Highland military regiments popularized it as a band instrument. Our Highlanders combine the uniqueness and beauty of bagpipe music with music from horns, woodwinds and drums.